today I want to talk to you about life. In this blog I talk so much about food and sports and health and so on. These are all important factors to stay healthy and be able to live a long and happy life. Though it consumes a good part of my daily time that’s not all life is about. The small things in between food and sports and sleep make a life worth living. We need to make room in our busy schedules for some experimenting and some exciting activities with the ones we love. 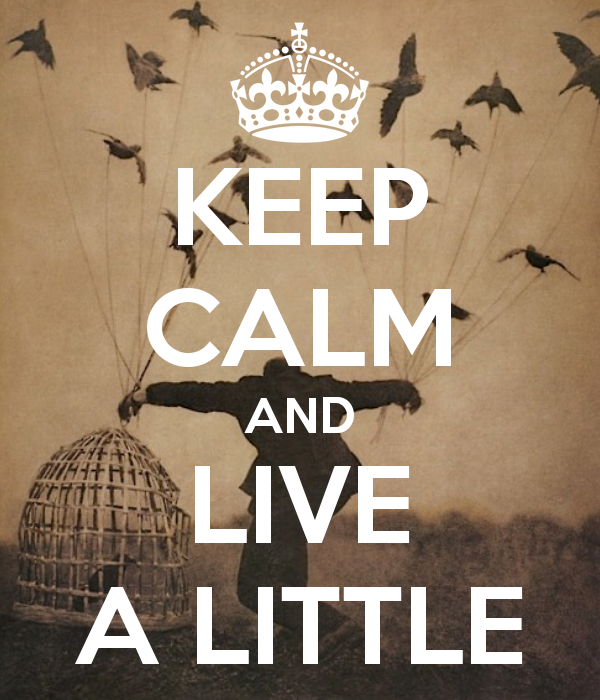 It’s so important to live a little… But what does that mean? I am not talking about something major like climbing the Mount Everest or living in an Ashram in India but I reckon everybody has a list of things in mind he or she always wanted to do but never actually did. For me it’s for example the Munich Westpark open-air cinema summer event: Kino, Mond und Sterne (Cinema, moon and stars). Over the last 8 winters I said: Next summer I will go to Kino, Mond und Sterne! And how often did I go? Once!!! – Yeah you might say: At least she was once… But this event is so much fun and I almost always miss it. And then it’s fall again and I am disappointed that it’s over without me joining in. Yes, you’re right. Mind-based lists are for the birds. And what will we do now? Right again, writing it down, cementing it, committing to it, doing it! You might say: Oh, just another boring to-do list. My life is ruled by to-do lists and don’t get me wrong but I am fed up with to do lists. Yeah, I absolutely agree. But this list is totally different from a to-do list. To-do lists almost always contain of must-dos! This list is a want-do list! And if I don’t want anymore (which I can’t ever imagine) I might not stick to it. But at least I decided this 🙂 Got the point? I am not so good at sticking to long term goals so I decided that 3,5 month should be enough to accomplish 10 things for 2013. 10 things seem to be random and in fact it is. It’s about 3 things a month which should be possible. There is nothing major on my list only some tiny things I will never do when I don’t write them down and cross out when achieved. They say it’s the little things that keep us happy! Enough ranting from me now, let’s get down to business…. Every time I accomplish one thing of my list I will post a picture tell you why I always wanted to do this and cross out the activity. Let’s see how far I get with my list. I have nominated you for the Liebster Award, check it out on my page I promise it’s not spam! !